Anyone care to share some favorite recipes?? I need some good recipes. Handsome was shopping once without his glasses and bought a package of dried morels. He thought he was getting a deal for $9... he missed the 1 in front of the 9. I've never made anything with morels and I'd hate to waste these little gems! We try to stay away from breading but I guess that is personal taste. There is another little creek that runs under Yensch between Oelke and Ostrander.. But this one is approximately 1/8 mile south of Day Road and runs south of Day.. coming almost along side of it before it crosses Day Road.. then it travels somewhere between Day and Stone.. Then I think it crosses Stone.. I know it winds and turns a lot, because its the same creek that runs behinds my Aunts house on Blue Bush, east of Raisinville.. The Culvert was probably five feet as it goes under Yensch.. I played there all the time.. and there was another spot in Rehbergs farm where they had a partial stone bridge.. and a low bank.. We built a fort there..
One time.. I was singing inside the culvert.. good acoustics.. I was singing Roberta Flacks' Killing Me Softly.. and these older boys.. there were three of them.. They were not men but older than me.. They walked up on me because they were spear fishing... I was never so embarrassed in all my life..
That's what that noise was. Could have been, that's ancient history. I remember running into other kids around there several times. don't remember a fort though. LOL.. I know I already told you about the time I put my car in the ditch in the dead of winter.. freezing cold and snow everywhere.. Your parents house was the nearest one.. It was late at night and I was on a toot!.. I told them my grandparents owned the farm before them.. they remembered the name.. They were so nice.. I think you mother made me tea and you father and brother got a tractor.. pulled my car out... Still had time to make the bars in Maybee!!!.. We pulled a lot of people out of the snow or ditch out there over the years. Most were drunk too. I'll have to get my County Map out, maybe the creek that went through our farm was Sandy Crk it runs all the way to the State Park. 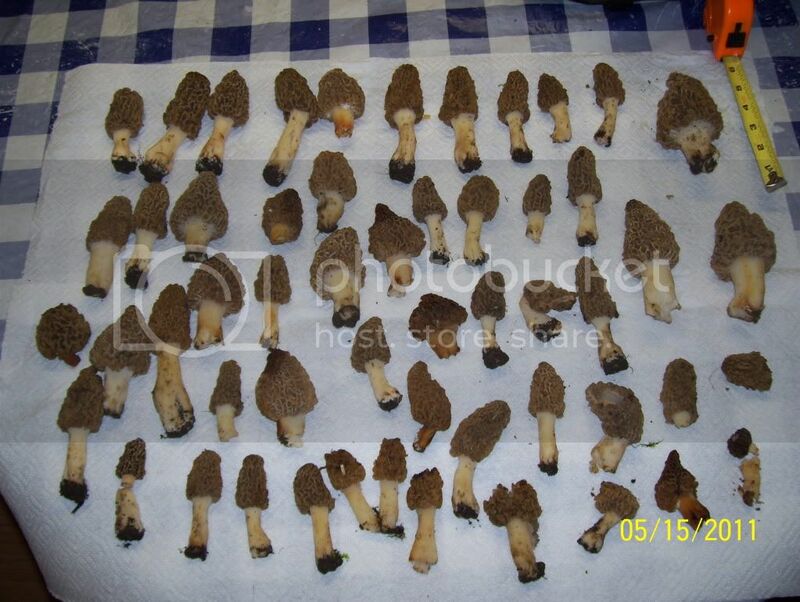 Morels usually quit about mid May depending on the weather. This year is cooler and wetter so they may last longer. I sure hope they last a little longer this year. So far we've only found ONE. Thanks for the advice Chicken. My wife and I went out today and found a nice bunch 54 total. Some were between 5 and 6 inches tall. These are the late ones and with this cool weather I don't know if we will find any more. You were right that's Little Sandy Creek and the one that went through our old farm was Sandy creek, I had them confused. Hey since you did all this running around and stuff did you ever trap mushrats? Just had to ask, my brother did a lot of that every winter up and down those creeks. Here are some pics took today. I really wish my mother was not so afraid of wild Mushrooms.. I have never had one.. I just remember that family and how they would have bread bag full.. They had five kids.. I am sure it really helped with their food bill.. I would see muskrats.. I remember one year our fields flooded so bad (the reason there is a Pond) Muskrats build their homes.. Sounds about like when we were growing up except I had 7 brothers and 1 sister. We've always eaten these mushrooms never got sick. 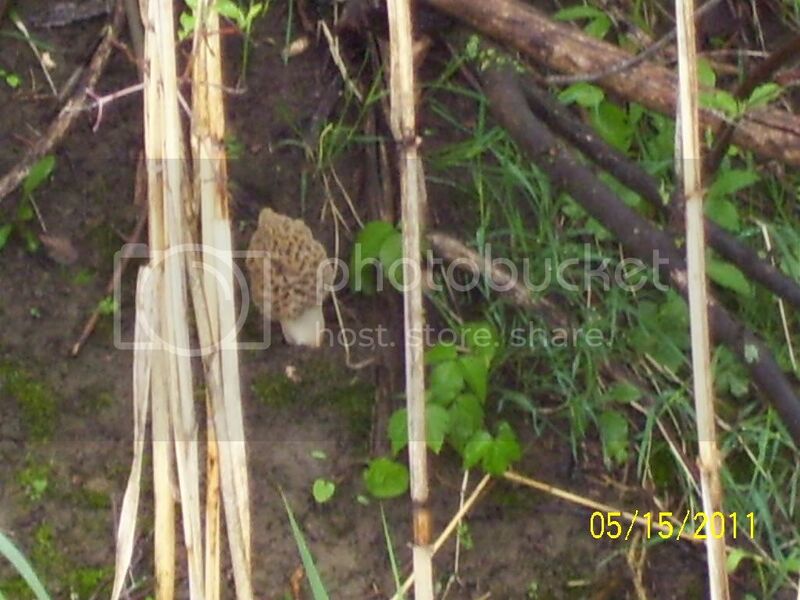 One time my aunt and uncle came out to look through our woods and found a huge bunch of mushrooms that looked a little like morels but had a real long stem and just a tiny head on them. 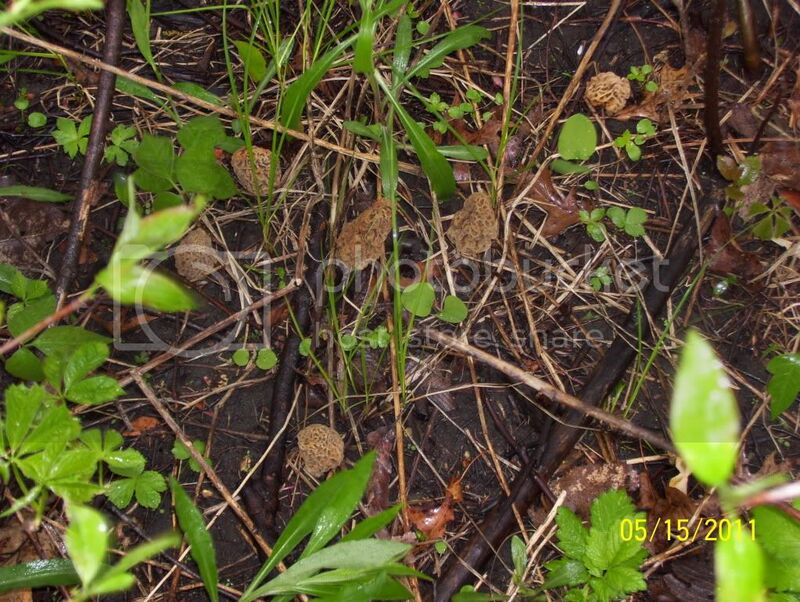 My uncle insisted they were morels but we weren't sure so we gave them all to him. We looked them up in a book and it said they were false morels, could make you sick. We were glad we didn't eat any. My uncle says they were good and they never got sick from them. We always just fried them in butter and man were they some good eating, fantastic flavor, we'll find out tomarrow when we eat these. I AM SO JEALOUS! I want to go hunting so very bad and this week is packed. We have not had much luck but I want to go out this week at some point. Anyone who knows me knows that I will talk to anyone so I guess I should just start knocking on doors. Thanks again for the info Chicken...........I think that we are just very inexperienced and have a tendency to not look in the right places! We don't knock on doors, we drive around till find a good spot and get out and look. If you don't find anything real quick we move on. There's no time for anyone to come chase us down and throw us out. The worst they'll do is tell you to leave. Never had anyone chase us out. We found these from the car window. I was looking out the passengers window from the driver's seat and seen the big one in the first picture. My wife didn't see it. When I got out I began to see lots more, so we grabbed the bag and started picking. These were on the creek bank, and some of them we had to drive down the road to find a spot we could cross then hike back to get them. They were all with in 10 feet of each other. I've heard to look under old apple trees, by dead elm trees and under live ash trees. We've found them in dark black soil, sand and just about anywhere. Can't figure any rhyme or reason but the weather this spring is very wet, which is one requirement. Warm weather, the second requirement, would make it even better. I think these are from that 81 degree day we had. This week will probably be the last if not too cold. Honestly, I need to go with someone that is a seasoned hunter.........I just don't usually have the eye for them. Where do you go? Along the woods? Where abouts without giving up your spots?